We performed an experimental investigation to assess whether the “restricted auction” mechanism proposed by Berkovitch, Israel and Zender in 1997 works effectively as an optimal bankruptcy law or not. 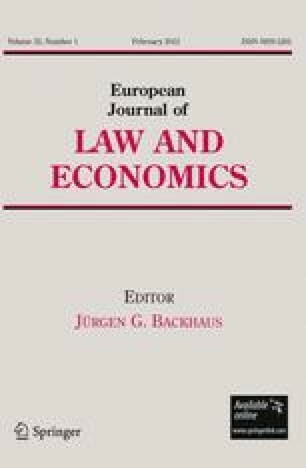 An optimal bankruptcy law is a commitment device that implements efficient choices both before (ex ante) and after (ex post) financial distress, even if moral hazard is binding. We designed an experiment focused on ex ante efficiency and we found that the restricted auction mechanism was able to direct an optimal amount of effort toward entrepreneurial activities. This result confirms the theoretical predictions. Nonetheless, we found that under a plain unrestricted auction mechanism our experimental subjects chose to allocate into their firms a larger amount of effort than that predicted by theory. Although difficult to justify on theoretical grounds, this experimental evidence is robust. Our behavioral interpretation is that this result is due to “moral sentiments”, such as the natural propensity of subjects toward socially desirable behaviors. In fact, we show that it vanishes once these motives are removed. The instructions are simple. If you follow them carefully you can earn up to 50,000 Experimental Credits (25 Euros). The experiment consists of 2 different phases. In each phase the computer will work out your payoff. At the end of the experiment, you will draw one of the 2 phases and you will be paid immediately and in cash the money you made in the drawn phase. Pay attention: your gain in each phase depends on your choices. If you have any doubt, do not hesitate to contact the experimenters for further information. Phase 0 consists of 3 ROUNDS. In each ROUND, the computer shows you 6 lotteries sequentially. Each lottery is represented by three colored areas. The possible outcomes of each lottery are displayed on your screen (and in the payoff tables on your desk) (Fig. 5). You have to choose the lottery you prefer to play. The computer will force you to scroll all lotteries before making your choice. After your choice, you move to the next ROUND. Each ROUND works in the same way. At the end of the third ROUND, one ROUND among the three you played will be randomly selected and the lottery you chose in that ROUND will be played for real: the computer swings a indicator over the three areas representing that lottery and works out your payoff according to the point where the indicator stops (Fig. 6). Take a closer look at the payoffs’ tables. Notice that, if the indicator stops at any point of the area where the payoff is the payoff of the outside option (blue area), you get a fixed payoff which is different from lottery to lottery; if the indicator stops at any point of the area where the payoff is the Nash bargaining payoff (red area), again you get a fixed payoff which is different from lottery to lottery; if the indicator stops in the area where the payoff is the realized cash flow (yellow area), you get a payoff that depends on the exact point where the indicator stops. This payoff is bounded between a minimum and a maximum, as you can see in the payoffs’ table. The minimum and maximum payoffs are different from lottery to lottery. Before the experiment starts, you are required to play with Phase 0 twice in order to get acquainted with the software and to check the consequences of your choices in terms of payoffs. You are an entrepreneur who has already run a project, financed by a bank (the computer). The final outcome of the investment is uncertain and depends partly on your effort and partly on your luck. You have to decide how much effort to put in your firm, considering the three different final situations which may occur (Fig. 7). Your firm can turn out to be both ECONOMICALLY and FINANCIALLY VIABLE. In the first situation, your firm goes bankrupt and you come back home with a payoff (blue area in the payoffs’ table) that depends on the level of effort H you have chosen. The liquidation value of your firm is 90,000 Experimental Credits. In the third situation, your firm is healthy and you come back home with a payoff which is bounded between a minimum and a maximum (yellow area in the payoffs’ table). The minimum and the maximum depend on the level of effort H you have chosen. In the second situation, your firm is auctioned off and you have to bid for it (red area in the payoffs’ table). It is a SECOND-PRICE SEALED-BID AUCTION that you and an outside investor (played by the computer) participate. The bank that financed your project is not allowed to participate the auction. The auction mechanism is simple and the computer will tell you what to do at any stage (Fig. 8). First of all, the computer collects the bid of the outside investor. After that, it asks you to type your bid. Then, the computer reveals the bids and announces the winner, i.e. the one who made the highest bid. The winner pays for the firm the price offered by the other bidder, which is the SECOND PRICE. For instance, if you bid 100,000 Experimental Credits and the outside investor bids 50,000 Experimental Credits, you win the auction and the price you pay for the firm is 50,000 Experimental Credits. If you win the auction, you earn a payoff which is bounded between a minimum and a maximum depending on the level of effort H you have chosen (“MIN” and “MAX” of “WON” columns of the red area in the payoffs’ table). If you do not win the auction, you earn a fixed payoff (“LOST” column of the red area in the payoffs’ table). The computer shows you 6 screens, one for each level of H (the level of effort you must choose to put into your firm). Each screen consists of 3 colored areas that represent the possible outcomes of your choice of H. These outcomes are displayed in the attached payoffs’ tables. After you have seen all the screens at least once, you can choose the level of H you prefer. After you chose a certain H, the computer shows you the corresponding screen. Then, it swings a indicator over the three colored areas representing your choice of H and computes your payoff according to the point where the indicator stops. Take a closer look at the payoffs’ tables. Notice that, if the indicator stops at any point of the area where the payoff is the outside option payoff (blue area), you get a fixed payoff which is different for each H. If the indicator stops at any point of the area where the payoff is the Nash bargaining payoff (red area), you participate the auction and get a payoff which depends both on whether you have or you have not won the auction, and the H you have chosen. If the indicator stops in the area where the payoff is the realized cash flow (yellow area), you get a payoff which is bounded between a minimum and a maximum. Notice that the minimum and maximum payoffs are different for each H. For instance, if you have chosen H equal to 5,000 and the indicator stops in the blue area, you get 2,500 Experimental Credits; if the indicator stops in the red area and you have not won the auction, you get 2,500 Experimental Credits; if the indicator stops in the red area and you have won the auction, you get a payoff from a minimum of 2,500 Experimental Credits up to 22,500 Experimental Credits; if the indicator stops in the yellow area, you get from a minimum of 2,500 Experimental Credits up to a maximum of 45,000 Experimental Credits. Instructions for Phase 2 are the same as those for Phase 1, except for the fact that experimental subjects are now advised that the bank is not only aware of the liquidation value of the firm, but also of its output. From this difference the new description of the auction mechanism follows. Notice that Phase 2 payoffs are the same as those for Phase 1.